Philadelphia 76ers guard T.J. McConnell (12) and guard Ben Simmons (25) high five against the Dallas Mavericks during the second quarter at Wells Fargo Center. The Sixers need to stop playing lineups with T.J. McConnell and Ben Simmons on the floor together at the same time. This seems obvious on many levels, and yet Philadelphia continues to run out these looks on a regular basis. This is nothing against either player and instead is a recognition of their limitations harming one another. For all the things that Bryan Colangelo got wrong, his instinct on this specific issue was right — Simmons needs to play next to guards who can shoot and/or offer some threat off the dribble. If Markelle Fultz did not have his soul consumed by Dementors, perhaps we wouldn't need to discuss this point. Instead, the Sixers have played Simmons and McConnell next to each other for 374 minutes this season. It has not been a very successful pairing, for reasons that should be clear. NETRTG does not tell the whole story, but it does provide us with a starting point — the Sixers are losing the minutes in which these two are playing together. Putting another ballhandler on the floor next to Simmons is helpful, given the halfcourt limitations of a team run exclusively by Simmons. Putting another ballhandler on the floor who isn't a threat to shoot from deep and isn't effective without the ball in his hands? That actually amplifies the problems a team built around Simmons has, as we saw when Markelle Fultz was put into the starting lineup earlier this season. With five seconds on the clock, that's obviously not great. The Sixers got a tough make from Butler on a stepback jumper, but as is too often the case with their halfcourt sets, they had to get by on talent, rather than straightforward execution. 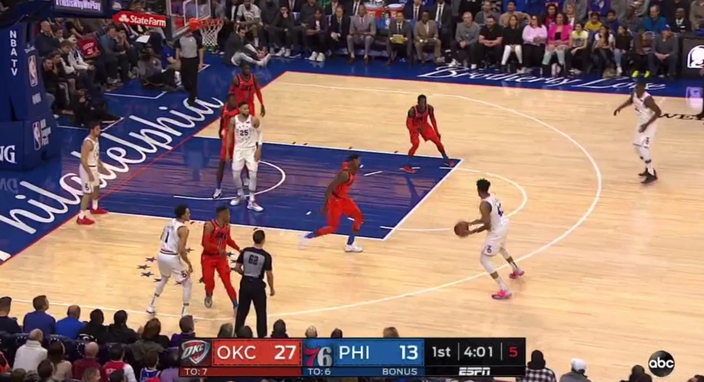 Earlier in the same stretch, Simmons was a little too lackadaisical when he caught the ball at the elbow and had his pocket picked by Russell Westbrook. But look at who Westbrook is ignoring to take this gamble in the first place, which shouldn't surprise anyone. The defense, despite being McConnell's calling card, was even more untenable, and that's really the theoretical selling point for playing McConnell in these lineups. Brett Brown has said in the past he doesn't necessarily want Simmons chasing point guards around for 48 minutes, and McConnell can give him a break there. McConnell can compete as hard as he wants, but he has no chance to stop Westbrook in a one-on-one situation. There was a play where he dropped nearly to the foul line to dare Westbrook to shoot, and instead, Westbrook just used the space as a runway to bounce off McConnell on the way to an easy layup. It wasn't much better against Dennis Schroder, who scored 16 first-half points by exploiting the McConnell matchup. This probably sounds like dumping a lot of blame on McConnell, but he has legitimate utility on the offensive side of the floor, provided he's put in positions that make sense. The Sixers have allowed him to run a bit of pick-and-roll lately, and he's a capable enough shooter from mid-range that he can make it difficult to defend the set. On the season, he's actually shooting a higher percentage on drives (albeit on around half the volume) than any other rotation player on the Sixers, Simmons and Butler included. There has been a bigger outcry about putting McConnell on the floor with Embiid, and admittedly the logic behind it is sound. With McConnell being ignored on the perimeter, it's a lot easier for teams to send help/doubles at Embiid with no consequence. But those lineups are still winning, and even if that's just a case of Embiid being able to overcome suboptimal context, it's a tougher sell to split up players and lineups that are coming out ahead routinely. For the record — the Sixers outscore opponents by almost five points per 100 possessions with Embiid and McConnell both on the floor. Weirdly enough, what this all seems to suggest to me is that the Sixers need another two-way wing, not a backup point guard that fits more cohesively with Simmons. With Butler and Embiid assuming more and more of the offensive responsibility, it should be up to Simmons to match up with the opposing team's lead ballhandler as much as possible. Zhaire Smith is still an unknown as it relates to his return to play, but a player in his mold is the sort of guy the Sixers need on defense — athletic enough to allow Simmons/Butler to drift off lead ballhandlers at times, but long and strong enough to bother wings when Simmons commits to taking an assignment like Westbrook. With Simmons off the floor, McConnell still has value as a guy who can get the offense moving and attack off a catch. The Sixers have absolutely killed teams in a limited (102 minutes) sample when McConnell shares the floor with Embiid and Butler, to the tune of a +17.9 per 100 possessions. A lot of that has to do with the star-power, but McConnell's offensive strengths and willingness to probe are valuable when his weaknesses aren't amplifying a pre-existing problem. 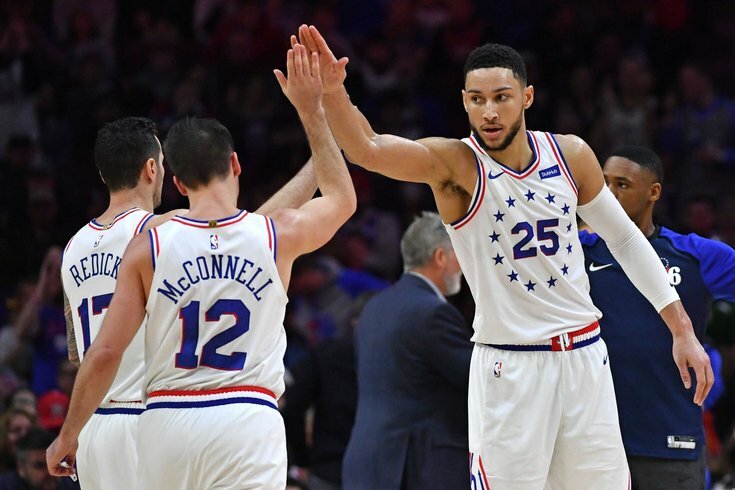 McConnell is a useful role player in the right context, and Simmons is a young star who finds ways to impact the game every night. But it seems obvious they are better apart than together, because of data we have on the two of them and lessons we learned during the Fultz experiment in the fall. Brown's recent rotation tweaks have been designed to get Butler and Embiid more time together, and the same effort needs to be made to best work around Simmons' strengths and weaknesses.